Jim and Lisa are Lifelong Northland residents and have been married 38 years! They have 35+ years of sales and customer service experience. 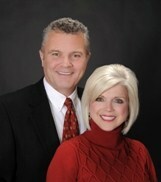 They have been in the real estate business for 16+ years and would Love to help you with all your real estate needs! Activities and Interests in the Northland and Liberty communities through current and/or past services include: Liberty Rotary Club past President, Liberty Chamber of Commerce, Liberty Park Board, Liberty Hospital Foundation Board, Liberty Public Schools, The Liberty Giving Circle, PTA, PEO, Liberty Christian Fellowship Church, The Northland Christmas Store, RT Store, Rebuilding Together Clay County, William Jewell College, University of Missouri, Washington University, Lupus Foundation of America and Sjogren's Syndrome Foundation supporters. Members of the National Association of Realtors, Members of Heartland MLS, Premier Members of Realtor.com and are E-Certified. We would love to help you with all your Realestate needs!